1 package wheat thins - 10 oz. pkg. 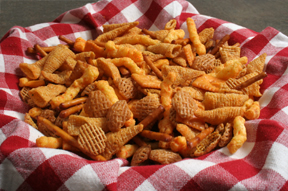 1 package Cheese Nips - 9 1/4 oz. pkg. 1 package Cheetos - 7 1/2 oz. pkg. 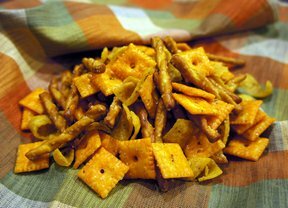 1 package miniature Parmesan fish-shaped crackers - 6 oz. pkg. In a very large bowl, combine the first eight ingredients. In a small bowl, combine oil and salad dressing mix. 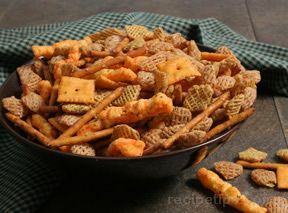 Pour over cracker mixture, toss to coat evenly. Transfer to four ungreased 15 x 10 x 1 in. baking pans. Bake at 250° F. for 45 minutes. Stirring every 15 minutes. Cool completely, stirring several times. Note: Can be made ahead of time. Stores well for a couple of weeks in air-tight container or it can be frozen for longer storage. 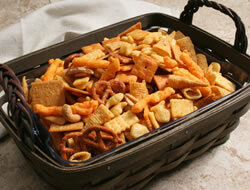 "An excellent snack mix and super easy to make. We made it to take with us on vacation with several couples and everyone thought it was great. It made such a big batch that we were able to eat on it all week and we still brought a little home. Make sure you have a very large bowl to make this in!"